I got some jack up link plates for my Tuono as a few extra mm for a bit more lean angle on the Fireblade stand, more room for my longer legs when at a stop and a bit of extra weight on the front all sounds marvellous. But to see if there really is much of a difference, it's time to break out my homemade spreadsheet (now now, stay with me, no dozing off!) and put some numbers to it rather than just feeling it. Besides, always good to know if you're going in the right direction. Here is my very much budget method for CoG measurements: Digi bathroom scales, two bits of material the same height is the scale, a bit of wall for balance and for those who don't have a Debbie McGee to hand, a WiFi camera pointing at the scale readout with a phone resting on the dash so whilst sitting on the motorcycle, one can read the scale. Or just normal camera and video the readout. Easy! 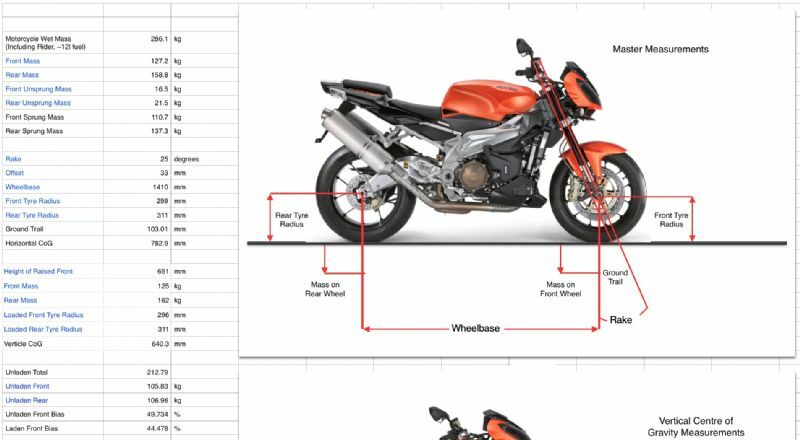 The Tuono has around 14l of fuel in, is wet/ready to ride condition and potential mass effecting mods include the Akra pipes and offset footpegs. The suspension's preload is set good for me, the shock is standard length/non adjustable and the forks are on their 3rd ring through the top triple clamp. 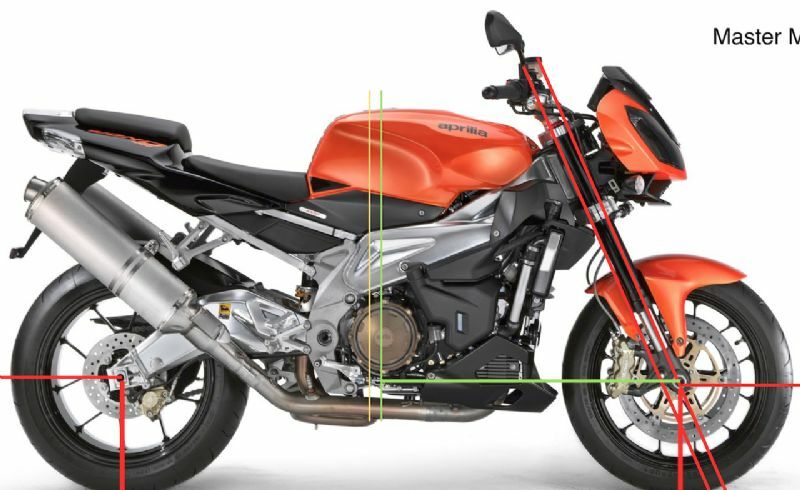 Wheelbase and geometry measurements are taken from online, probably more accurate than me trying to take dynamic measurements with a tape measure! OE set up with me aboard: Horizontal CoG 782.9mm from front axle centre, 44.478% front weight bias. New jack up link plates with me aboard: Horizontal CoG 754.4mm front front axle centre, 46.495% front weight bias. And the difference visualised. Yellow vertical line is OE horizontal CoG location. Green is the new CoG location resulting only from the link plates. I've got loads more potential chunks of info and results for other things like this ready to go, just need to be able to do some measurements. But the rather boring weekend hours for this cold, damp time of year will be the time to do them. 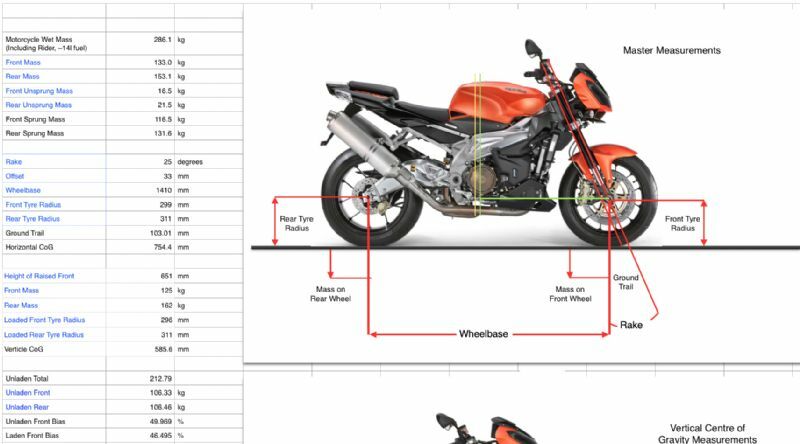 CoG height would be next most desired thang but thats tricky with a team at the best of times; gotta weigh the front when its on a surface around half a metre above the rear!